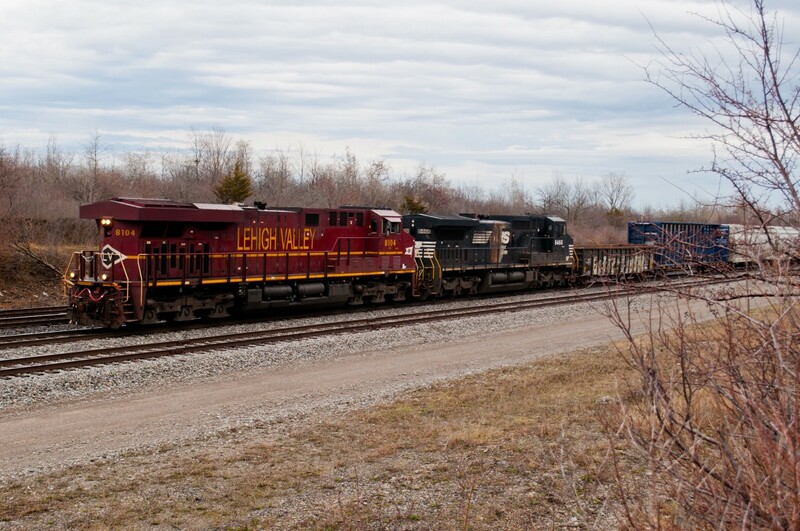 Railpictures.ca - Doctapinklaces Photo: In less than ideal weather, NS C093 backs into the Fort Erie yard with NS 8104, the Lehigh Valley heritage unit with longhood forward. While it’s always cool to see a heritage unit, seeing one with ties to the area is all the better, as Lehigh Valley actually use to run to Fort Erie back in the day. | Railpictures.ca – Canadian Railway Photography – photographie ferroviaire Canadienne. Caption: In less than ideal weather, NS C093 backs into the Fort Erie yard with NS 8104, the Lehigh Valley heritage unit with longhood forward. While it's always cool to see a heritage unit, seeing one with ties to the area is all the better, as Lehigh Valley actually use to run to Fort Erie back in the day. Thanks a nice catch. You must have known it was coming. What hour of the day is this transfer coming over now?